A friend of mine, through my Fiancee, recently celebrated her 50th birthday with her sisters in Brussels... talk about celebrating in style! He asked me to make a card and honestly I couldn't pass up the opportunity to ink up some new rubber... and then I wanted to water color... so I have the main portion the of the card completed, but no idea where I want to do with the rest. Any suggestions? I matted it on black, and rounded the edges, and then I just didn't have much more left in me... but I love love love the stamp!!! and then I have to put a saying with it... so I am really searching for ideas. 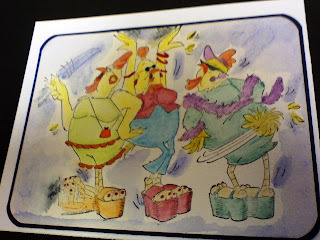 EDITED: I completed the card, and its postal, I added some rhinestones to the earrings on the chickens, some glitter to the boa, and crystal effects to the toenails and bracelets. I added a "50...?" in blue, then on the inside, I added "NOW that is something to squawk about! Happy Birthday". It was mounted on real red card stock. I liked it, but didn't get pictures of it. DARN!!! o well, next time I will remember. Thank you all for your suggestions. Never too old to shake your tail feathers! How about either glitter or some rhinestones to jazz it up?